Eating healthy food is an important part of managing your diabetes. Eating well with diabetes doesn't mean you need to eat different food from your family. However, you do need to know how much carbohydrate, and what types of carbohydrate are in your food, as these will directly affect your blood sugar levels. 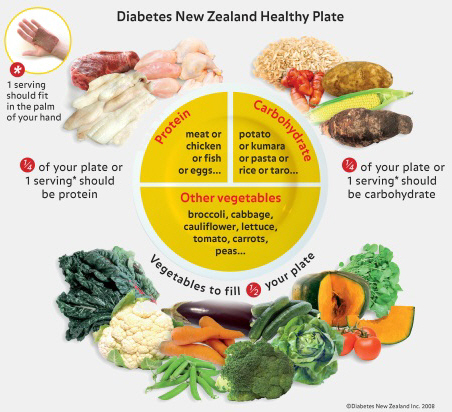 You should base your meals on the Diabetes New Zealand healthy plate model, shown in the picture on the right. This means eating starchy carbohydrates, lean meat, fish, or eggs, and plenty of vegetables, in the right portions as shown on the plate. You also need some fruit, low-fat dairy products, and healthy oils. You may want to consult a dietitian to help you develop an eating plan that suits your lifestyle and manages your diabetes. A dietitian can also help you to lose weight if you need to. Comprehensive advice about eating healthy food to help you manage your diabetes. Healthy recipes for salads, mains, desserts, and more. It also has information about how to adapt your recipes to make them healthier. Written by Christchurch Diabetes Centre dietitians. Adapted by HealthInfo clinical advisers. Last reviewed February 2017. Last updated March 2019. New Zealand Guidelines Group. New Zealand Primary Care Handbook 2012. 3rd ed. Wellington: New Zealand Guidelines Group; 2012.